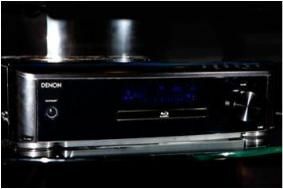 BRISTOL SHOW 2010: Denon S-5BD 'Cara' makes its European debut | What Hi-Fi? It combines a Profile 2.0 Blu-ray player and Dolby Pro-Logic IIz receiver with full HD audio decoding, and is also one of the first products announced with HDMI 1.4 support, including Audio Return Channel. The sleek unit hides extra connectivity behind side cheeks either end of the front panel, which open to reveal one of the three HDMI inputs, a USB socket able to accept USB memory devices or an iPod, and SD card and connections for the set-up microphone and a pair of headphones. There's also connectivity for the company's Network Control Dock for iPod, two digital inputs – one optical, one electrical, and two stereo analogue inputs. As standard the unit has 5x75W (into 4ohm) output, but it has preouts for the extra channels required for Pro-Logic IIz, to which an additional power amp can be connected. A subwoofer preout is provided, and the Denon can also deliver stereo audio and composite video into a second room via preout sockets, or operate as a 3.1-channel system using Dolby Virtual Speaker surround processing while driving a stereo pair of speakers in a second room. In addition, the internal amps can be reassigned internally to give a more dynamic sound when operating in stereo or 2.1-channel mode. The Audio Return Channel will allow a suitable TV to send audio back to the S-5BD from its internal tuner, thus avoiding the need for extra connections for TV sound, there's Auto Lipsync, and HDMI CEC control will allow one-button start-up of system and TV, subject to compatibility. Audyssey MultEQ set-up is used for calibration, and the unit also has Audyssey Dynamic Volume and Dynamic EQ, for control of level and low-level listening respectively.